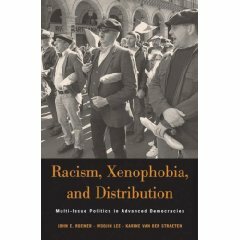 August 1998 - December 2000: Lecturer in Economic Theory, School of Economic Studies, University of Manchester, U.K.
Racism, Xenophobia, and Distribution: Multi-Issue Politics in Advanced Democracies, 2007, Cambridge, MA: Harvard University Press (with John Roemer and Karine van der Straeten) Giacomo Corneo reviews the book in the Journal of Economics. Click here. "Inequality and Redistribution: Political Parties May Matter," 2014, Journal of Institutional and Theoretical Economics, 170(3), 482-495.